Dolphins, whales, seals and other marine mammals have a crucial role in maintaining the health of life found in our oceans and seas, and their well-being reflects the overall status of marine ecosystems. The Greek seas within the broader Mediterranean Sea context are home to key marine mammal species. Despite their unique value, however, they are still facing important threats. 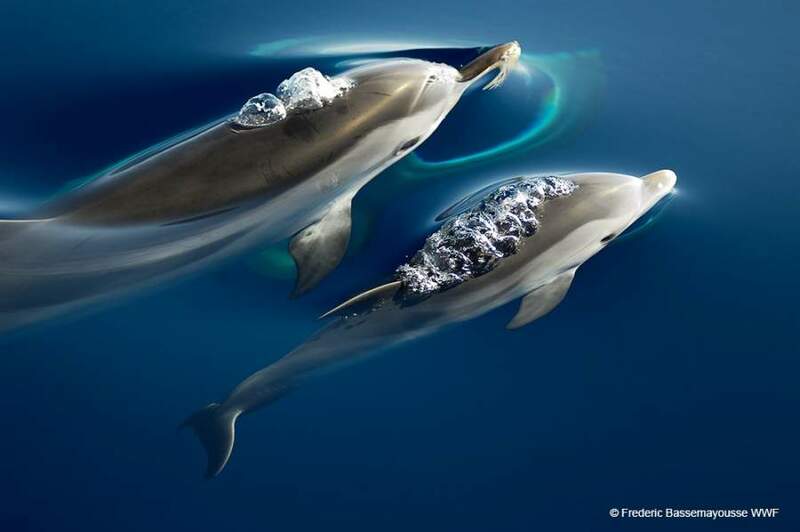 The protection of marine mammals is a top priority for WWF Greece. This year, WWF Greece and the International Committee on Marine Mammal Protected Areas organize jointly the largest international conference dedicated to those inhabitants of our seas. Specifically, the 5th International Conference on Marine Mammal Protected Areas will take place in Messinia, Greece, from 8-12 April 2019, and will bring together scientists, experts in the management of marine protected areas, private sector representatives, as well as governmental agencies and non-governmental organizations from all over the world, to discuss the future of our seas. This is the first time that the conference takes place in the Mediterranean, and specifically in Greece, which makes our country the main focus of the international community tasked with protecting marine mammals. At the same time, this is a unique opportunity for the convergence and exchange of scientific knowledge, and for experts to present international good practices and examples. One of our goals is to highlight the significance of areas that are important for the Mediterranean marine mammals, which are facing direct and increasing pressures due to human activity. Until today, there has been a significant scientific knowledge gap when it comes to the threats facing these areas —an example in our country being the Hellenic Trench, which arches from the northern Ionian Sea to the island of Rhodes. It should be noted that nine sea mammals reside regularly in the Greek seas: the fin whale; the Mediterranean monk seal, with half of its global population residing in the Mediterranean sea, and Greece in particular; the sperm whale, the species with the largest brain ever recorded in the animal kingdom; the timid Cuvier's beaked whale; the Risso’s dolphin; the common bottlenose dolphin; the striped dolphin; the common dolphin; and the tiny harbour porpoise, that resides exclusively in the sea area of Thrace. Five more species cross the Greek seas during their migration: the humpback whale, the common minke whale, the false killer whale, the mesoplodont whale and the rough-toothed dolphin. Unfortunately, most of these mammals are endangered, with humans posing their greatest threat. Harassment by recreational boats, noise pollution caused by larger vessels, interactions with fisheries and climate change are only a few of the dangers facing these mammals. And now, the threat posed by oil and gas exploration and drilling is being added to the list. There is considerable risk of accidental oil spills, but even during the initial prospecting stages the noise caused by induced seismicity can have a significant negative impact on marine mammals. Additionally, the increased marine traffic required for the construction of installations and oil transfer will significantly impact the species found in these areas. Among other issues, the challenges posed by oil drilling in the main marine mammal habitats will take center stage in the 5th International Conference on Marine Mammal Protected Areas. One of the most important sessions will revolve around the need to prevent environmentally harmful practices, such as seismic exploration, in areas of high importance for marine mammals. This session will highlight the looming threat posed by the ratification of conventions on the commencement of oil extraction activities in the Hellenic Trench, and is expected to unite the international community in favor of protecting the area, drawing on examples from other important areas around the world. More than 250 participants from 40 countries around the world are expected to attend the coming event. Additionally for the first time in Greece, the conference will be attended by a new generation of Greek and foreign scientists, who will have the unique opportunity to draw on precious knowledge from their more experienced colleagues. Keynote speakers include some of the most recognized and respected experts in the marine mammal management in the world, representing international organizations along with the global WWF network. We also expect to be joined in the conference events by high-ranked representatives of official bodies that are supporting marine mammal conservation efforts.